Super Eagles will be in action against Seychelles at Stephen Keshi Stadium on Friday, and many Super Eagles fans are looking forward to it. Head coach Gernot Rohr called up 23 players for the game and the upcoming friendly against Egypt four days later but he is only privileged to name maximum of 18 players for the game. Almost all soccer loving Nigerians are expecting Leicester City's midfield enforcer Wilfred Ndidi to return to Rohr's starting line-up on Friday due to his regular show of character for the Foxes. Seychelles' game isn't a make-or-break tie : The Super Eagles have already booked their place at the upcoming AFCON tournament, hence, there is no need featuring the midfielder on Friday. The 22-year-old star has featured in all of Leicester City's League matches throughout this season, Rohr should give him a much-deserved rest. Time to Test New Midfielder : Ndidi's class and quality is too obvious for everyone to see. This is why Rohr and his coaching staff must give other players opportunity to showcase their abilities. Rotherham's Semi Ajayi, Hapoel Be'er Sheva's John Ogu are capable replacement for the Leicester City man. One of the two players can partner Etebo and Alex Iwobi at the middle of the park. 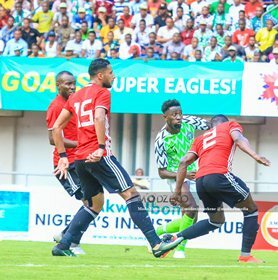 Ndidi is hugely needed against Egypt : Nigeria have a point to prove against Egypt in the upcoming friendly match, knowing well that the Pharaohs prevented them from qualifying for the 2017 AFCON Tournament. It is important Rohr rests most of his regulars, including Ndidi, on Friday for them to prepare for Egypt's challenge. Ekong, Ndidi, Balogun, Iwobi, Ighalo, Simon Moses and Musa should be rested ahead of Egypt game.